A romantic retreat or a family getaway, either perfect choice. Designed to highlight the breathtaking views from every room of this home, 104 Oceanwood features a private hot tub, access to several open decks and an oceanfront community pool with gazebo. 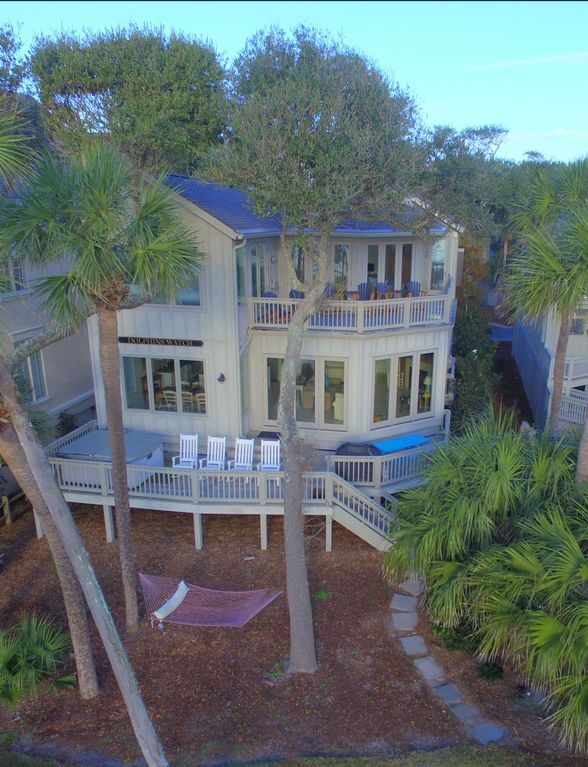 Offering 4 bedrooms, 4.5 bathrooms, and direct beach access, this is one of the most desired properties on Hilton Head Island. I am one of the owners and I have been in charge of the rentals for 6 years along with my husband and the property management company. I follow the Golden Rule in all of my rental dealings. I always ask, 'how would I want to be treated' and do onto others accordingly. We value our repeat renters and want you all to come back year after year and enjoy our home almost as much as we do. We love Hilton Head Island for all of its natural beauty, ocean access, the 12-mile beach and healthy lifestyle. All is so convenient too you hardly need to do any driving. We love the ocean, long walks, collecting shells, making friends with the dolphins, tennis, bike riding, and cook in most often as the seafood is so good. Almost perfect 4 bedroom vacation home on the Atlantic Ocean in a great section of Hilton Head with access to stores and restaurants 1.3 miles away. Absolutely great vacation property. The Vacation Company did an excellent in preparing the property and was phenomenal in their responses to an AC issue and propane tank for BBQ issue. Few negative issues were the bed quality in the master BR overlooking the Atlantic Ocean with worn our springs, worn down hammock and worn down chairs by the community pool. As I love to cook the blades for the hand mixer were no where to be found and there was was no vegetable peeler. Other than that the house was perfect and even includes 4 bicycles for use. We are very pleased to hear about your recent visit to Hilton Head and greatly appreciate the feedback you have provided! This home is in a great location with many great nearby amenities. As for the few cons experienced, we have made note of this so that it can be addressed for future rentals and thank you for these remarks. We hope you plan to visit Hilton head again in the future as we would be more than happy to assist with any rental needs you may have! This is our second time staying at this gorgeous home. It was even more beautiful than I remembered. The views were amazing and could be seen from just about every room in the home. We had a very relaxing and fun family vacation. Woke up every morning to sipping coffee while watching the waves (and Dolphins) from the back porch. Mid morning my husband and I walked to the tennis center for a lesson and then spent the afternoon at the beach and the pool. In the evenings we took bike rides to Coligny Plaza for dinner and ice cream. So much fun! Perfect location and plan to return again next year! Thanks for a wonderful family vacation! This home is perfect for family vacation. Pool close by, but not close enough to be dangerous for small children....this was our 4th year renting this home, wish you could add a bedroom, since our family is growing....would like additional living room furniture. I can not believe how perfect this home was. The space was great for 5 adults and 3 children. The views are awesome from any place in the house!!! Having two family rooms was a good thing too. Adults in one while the kiddos hung out in the other family room. The jacuzzi was a great thing to have for the evenings. Hopefully we can make this an annual event with the family!!! Thank you for taking the time to send us a review for 104 Oceanwood. We are thrilled to hear that you had a great vacation and enjoyed this home. We hope that you'll return to stay with us again in the near future.